A dwarf, procumbent, busy evergreen shrub, or a neat bush 2 to 5 feet high with upright branches, or a small tree reaching 30 feet high; bark chocolage-brown, coming away in flakes on the old branches, young twigs divaricate. Leaves very numerous, persistent, arranged mostly in threes, spreading at right angles and rigid; when full-grown, about Â½ inch long, linear, tapering to a sharp prickly point, articulated on stem, with a prominent knob at the base above, channeled, glaucous or pinkish, with green margins, above, bluntly keeled and bright green beneath; shorter and more concave a the base of the branches. Flowers dioecious, the male in male in small catkins with a few small scales at the base, ovoid or globose, consisting of several whorls of decussate horizontal stamens. Female cones consisting of about 12 to 16 green, ovate, acute, fleshy scales, closely placed in 3 to 5 rows on a short axis and overlapping, the lower empty; the uppermost 3 surrounding the naked ovules, thinner, pinkish. Ovules erect, 3, alternating with the scales. Fruit berry like from the growth of the three uppermost bracts of the cone. Seeds small, 3 in each fruit, close together, their upper half conical and triangular, the lower rounded; testa very hard, with several large glands or sacs on its lower part; embryo straight, in scanty endosperm, cotyledons 2, small; radicle superior. Diuretic, stimulates the flow of bile and the appetite. An essential oil (similar to turpentine oil), tannins and flavonoids, (+)-catechin, acetic acid, alpha-humulene, alpha-phyllandrene, alpha-pinene, alpha-terpinene, alpha-terpineol, ascorbic acid, beta-carotene, beta-pinene, betulin, borneol, bornyl-acetate, camphor, caryophyllene, citronellal, citronellol, epicatechin, farnesol, gamma-terpinene, limonene, menthol, myrcene, nerolidol, p-cymene, pectin, rutin. In urinary tract diseases, dropsy, digestive maladies, maladies associated with the chills, rheumatism and body aches. Oil of Juniper is given as a diuretic, stomachic, and carminative in indigestion, flatulence, and diseases of the kidney and bladder. The oil mixed with lard is also used in veterinary practice as an application to exposed wounds and prevents irritation from flies. 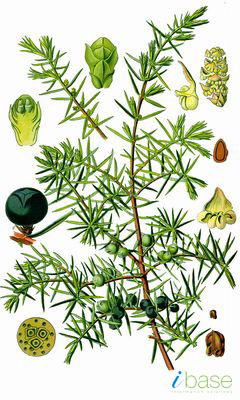 Spirit of Juniper is employed as a stimulating diuretic in cardiac and hepatic dropsy. The fruit is readily eaten by most animals, especially sheep, and to prevent and cure dropsy. Should not be taken for longer than 5 weeks if kidney inflammation is present and when pregnant.